Walkways and crossings are prerequisites for walking. Portland, OR. Infrastructure within the school zone and beyond is a prerequisite for walking and bicycling. The physical environment often determines whether many children walk or bicycle to school. To safely walk or bicycle to school along a street or separate path, or to cross a street along the way, children need well-designed, well-built, well-maintained, and accessible facilities. SRTS programs address infrastructure needs at schools as well as along a child's route to school. Children walk and bicycle to school from locations outside the immediate school zone and often from beyond the school's designated walk zone. An important aspect of enabling children with disabilities to walk and bicycle to school is provision of accessible infrastructure. Guidelines for making schools sites and routes to school accessible for children with disabilities can be found in the Americans with Disabilities Act Accessibility Guidelines (ADAAG) and the Public Rights-of-Way Accessibility Guidelines (PROWAG). Throughout this guide, the term "pedestrian" should be understood to include students using assistive devices such as wheelchairs. The relationship between the crossing, the building and the sidewalk are important elements in developing a safe route to school. Mary Scroggs Elementary School, Chapel Hill, NC. The relationship of school buildings to sidewalks and street crossings can determine the level of comfort and safety a pedestrian or bicyclist experiences. All elements are interconnected: the street is connected to the sidewalk and the sidewalk is connected to the building. Getting this relationship right is critical. 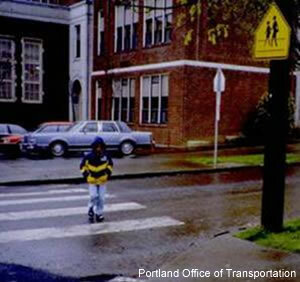 One important point is: do not put motor vehicles between sidewalks and schools. Such obstructions add a conflict point on a child's walking route. Another relationship to consider is the school's location relative to its students' homes. A child's route to school should have a minimal number of busy street crossings, and school attendance boundaries should be drawn with this principle in mind. Easy-to implement and low-cost solutions are focused on first, while longer-term improvement needs are identified and the implementation process is begun. Crosswalks are an effective, low cost, and easy to implement engineering treatment. It is important, however, to be aware of guidelines for appropriate placement and use of crosswalks. Effective improvements do not always require substantial funds. For example, signs and paint are relatively inexpensive and can make a big difference. Completion of these projects can build momentum and community interest in making other improvements. Smaller cost-effective projects, when concurrently implemented with larger more expensive projects, are likely to have lasting impacts on the built environment and garner interest and support from the community. Some engineering improvements will require substantial time and financial commitment. Projects such as new sidewalks and bridges or the reconstruction of a street crossing should be identified early and advanced through the various stages required to complete them. As these longer-term improvements are developed, smaller projects, such as installing ADA-compliant curb ramps, can be implemented to build momentum and maintain community interest in creating safe routes to school. Engineering treatments are matched to the type of problem. As communities consider improvements for the routes to school, care should be taken to identify problems or obstacles and to provide appropriate solutions to alleviate these specific problems. 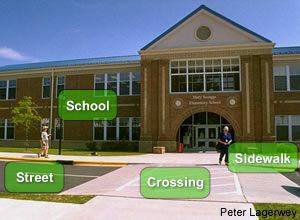 Create school walking and bicycling route maps using a variety of assessment tools and exercises. Identify and regulate the school zone. Provide and maintain bicycle and pedestrian facilities along the school route including sidewalks, on-street bicycle facilities, paths, curb ramps, and accessible pedestrian signals. Provide safe street crossings for bicyclists and pedestrians.